The Department of English lost an important mentor, teacher, scholar, and friend when Donna Gerstenberger died on January 16, 2012. Donna was a member of the faculty from 1960 to 1994 and served as Department chair from 1976 to 1982. Raised in Spokane, she earned her BA from Whitman College and her Ph.D. from the University of Oklahoma. 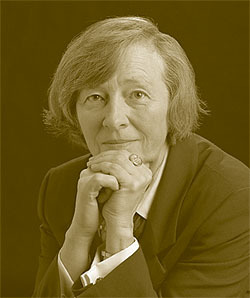 Donna was the first woman to be promoted to full professor in the Department, designed and taught the first UW courses on women and literature, was instrumental in reshaping the English Department Graduate Program, and went on to be Associate Dean of Arts and Sciences and Chair of the Faculty Senate. She cared deeply about both poetry and fiction and was the co-founder (with Nelson Bentley) and first editor of The Seattle Review . Early in her career she wrote (with George Hendricks) a two-volume checklist of criticism on the American novel; she then went on to publish scholarly books on Richard Hugo, Iris Murdoch, and John Synge. She loved the poetry of William Yeats, and was passionate about modernist women writers, especially Virginia Woolf and Gertrude Stein, both of whom she was fond of quoting at grand University occasions. Along the way, she published articles in numerous journals on Stephen Crane,William Faulkner, and Djuna Barnes, among others. A wonderful teacher, she mentored many students who are now teaching at universities around the country. They will always remember her dry wit, her low-key style, her fabulous trench coats, her intellectual rigor, and her fast cars. Donna and her partner of 51 years, Yvonne Mandorf, traveled widely in Europe, and made memorable trips especially to Greece and Italy, where they went several times. Together, they raised dogs with champion bloodlines, first English setters and then English spaniels, and loved taking them to beaches to run. After her retirement from the University, Donna continued to be an avid reader and loved a good mystery as well as a good poem. Whenever she could, she worked on her golf game, especially in Tucson, where she and Yvonne lived during the winter months. She also studied watercolor and took a watercolor class in Assisi, where she had her own unorthodox technique and subjects. She loved surprising her teacher and fellow students with scenes of the Northwest when others were working on the golden fields of Umbria. In addition to Yvonne, Donna is survived by her step-sister, Sue Bergman of Tulsa, OK, her beloved English Springer spaniel, Cassie Mae, and innumerable friends. A celebration of Donna’s life was held at the University Club at 4 pm on Sunday, April 29. Friends, colleagues, and former students shared memories of Donna.